If found, this init process is responsible for bringing the system the rest of the way up, including locating and mounting the real root device (if any). If rootfs does not contain an init program after the embedded cpio archive is extracted into it, the kernel will fall through to the older code to locate and mount a root partition, then exec some variant of /sbin/init out of that. # Testing external initramfs using the initrd loading mechanism. 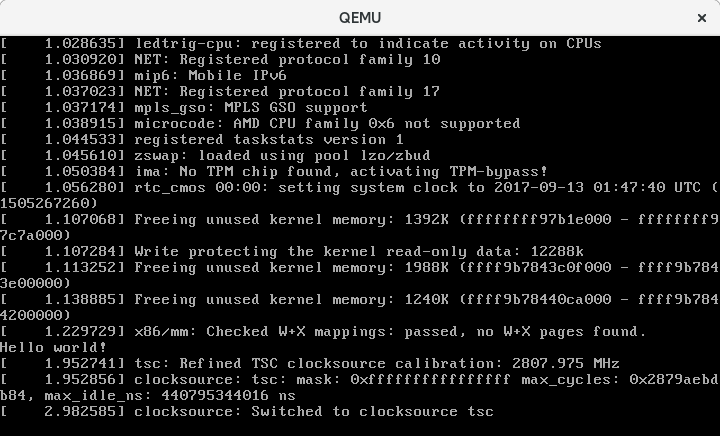 After the kernel boots successfully, you will see “Hello World” at the bottom of qemu window. Note: if you disable gui, you can switch to qemu console with ctrl-A + C + ENTER. Then you can exit by quit command in the qemu console. For more detail you can refer to one blog.